“Echo in the Canyon,” which opened the 2018 Los Angeles Film Festival on Thursday, is the first documentary ever chosen for the opening-night slot at LAFF. But the festival has clearly learned a lesson from fests like Sundance and Toronto: If you want to kick off your festival with a guaranteed crowd-pleaser, pick a music doc. So as Sundance has done in recent years with “20 Feet From Stardom” and “What Happened, Miss Simone?” and Toronto did with the U2 film “From the Sky Down,” LAFF had a celebratory opening with “Echo in the Canyon,” first-time director Andrew Slater’s look at the Laurel Canyon music scene of the 1960s in Los Angeles. The open-air screening at the John Anson Ford Amphitheatre was followed by a concert at which Jakob Dylan and a handful of guests, including Jackson Browne, performed music of the era. And while the film seems unlikely to follow “20 Feet” and “Miss Simone” to an Oscar nomination, it made for a lively start to a festival that is making a risky move to September in an attempt to stake out new territory on the festival calendar. In recent years, LAFF had taken place in June, where the Film Independent-backed festival struggled to establish an identity in a slot that placed it between Cannes in May and the fall trifecta of Venice, Telluride and Toronto in August and September. But this year’s move drops it into the calendar at a time when most of the high-profile titles have just premiered at those other fall festivals. In addition, the more established New York Film Festival opens on Sept. 28, the day after LAFF concludes, and the AFI Fest, a more desirable destination for awards titles, is coming to Los Angeles in early November. “We are the L.A. Film Festival,” Film Independent president Josh Welsh said in his introductory remarks on Thursday, coming down hard on the L.A. part of that name. And “Echo in the Canyon” is an L.A. film. Part concert movie, part historical survey, part a group of pals sitting around and talking, the film is mostly a love letter to Los Angeles music of the mid 1960s, specifically the music made by a group of largely (but not entirely) folk-based musicians who lived and hung out in Laurel Canyon. They included members of the Byrds, the Buffalo Springfield, the Beach Boys and The Mamas and the Papas, all of whom made music that is featured prominently in the film. The film’s tour guide to this scene is Jakob Dylan, who’s made a string of albums by himself and with his former band, the Wallflowers. Dylan wasn’t even born until 1969, and his dad Bob was only a member of the scene as an inspiration — though curiously, “Mr. Tambourine Man,” the Bob Dylan song that essentially launched the Byrds and by extension the Laurel Canyon scene, is referred to but never heard in the film. 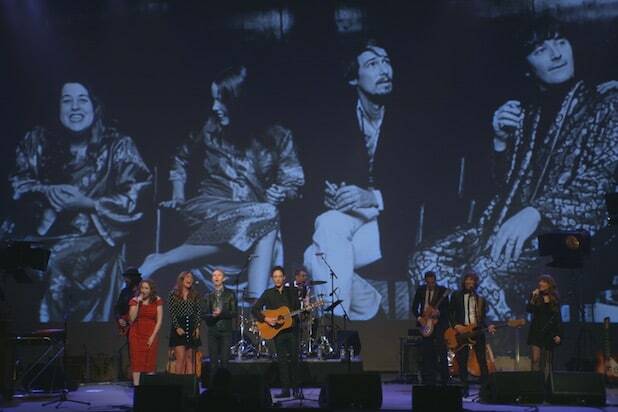 “Echo in the Canyon” has been a long time in the making – the project first surfaced as a concert of the same name at Los Angeles’ Orpheum Theatre in 2015, with Dylan performing songs of the era with the help of Fiona Apple, Cat Power, Beck and others. At the time of the concert, it was announced that an album would follow the next year, and that footage of the show would also be used in a feature film. But the album never appeared, and it took three years for concert footage from that night to show up in a film. That footage is intercut, usually seamlessly, with rehearsal and studio footage of the same musicians performing those songs, and occasionally with archival footage of the originals. Toward the end, the momentum lags as we get another round of musicians saying what they said earlier: the scene was informal, you just walked up the street and dropped in on your friends’ houses, it was a magic time … At this point, you could argue that it might have been preferable to continue the story into, say, 1970, to bring in some fresh faces. But “Echo in the Canyon” isn’t designed to be a history lesson; it’s an enjoyable snapshot of a moment in time, and of the way that moment is reflected and refracted in the hands of today’s musicians. The screening was followed by a brief Q&A, and then a concert in which Dylan ran through six songs from the film – three from the Mamas and the Papas and one each from the Association, the Turtles and the Byrds – and one additional song, “The Waiting,” as a tribute to Petty. But by then the audience was looking for celebration rather than precision, which is what they got. And the night also had the feeling of an event because the premiere took place in a suitable hillside setting only a couple of miles as the crow flies (or, you know, 20 minutes to an hour as the car drives, depending on traffic) from the heart of the scene it depicts.